FAI chief executive John Delaney has left his position and moved into the new role of Executive Vice President with immediate effect. It comes as part of a senior management restructure within the association following an independent review. Chief Operating Officer Rea Walshe has been appointed Interim CEO. 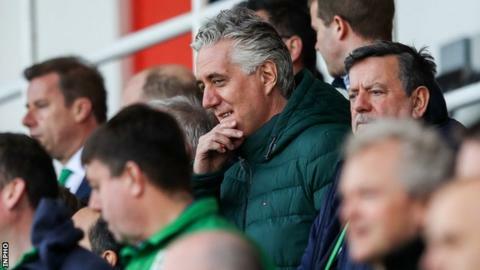 The news comes less than a week after it was revealed that the FAI received a 100,000 euro loan from Delaney in April 2017 which was repaid two months later. Last week the Irish Government wrote to the FAI to demand further information on its financial dealings after questions were raised over the circumstances of the loan. The governing body stated that the "bridging loan" was repaid in full to Delaney two months after it was received. Delaney, a former Vice President of the Olympic Council of Ireland, said he had loaned his employers the money "to aid a very short-term cash flow issue". The restructure comes following a review carried out by a sports industry consultancy firm directed by Jonathan Hall, the English FA's Director of Football Services between 2008 and 2015. The final report concluded that Delaney should step into the newly created Executive Vice President position. "The new role would be a specific defined role with responsibility for a range of international matter and special projects on behalf of the FAI," stated the report. Delaney's new responsibilities include all FAI tournament bidding projects, meaning he will take a central role in the FAI's joint bid to host the 2023 European Under-21 Championships, which they launched alongside the Irish FA last November. Walshe, who was promoted to Chief Operating Officer last month, will assume the position of CEO until a permanent appointment is revealed in May.